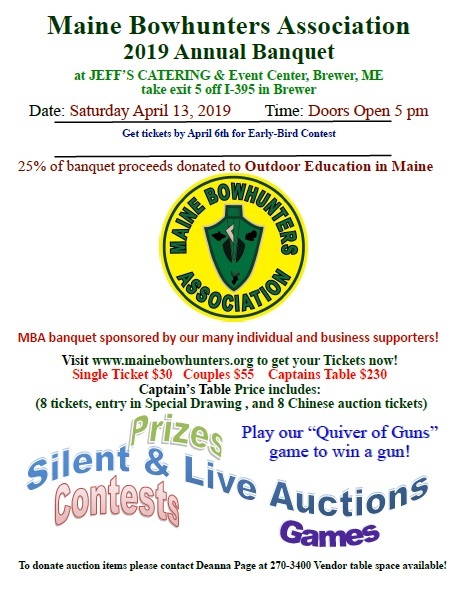 We as passionate and dedicated bowhunters need to step up and fight this bill that has very clearly been opposed by SAM, The Maine Guides Association, and Maine Bowhunters Association. Please go to our website for more info. Please contact your State Senator to voice your opinion NOW. 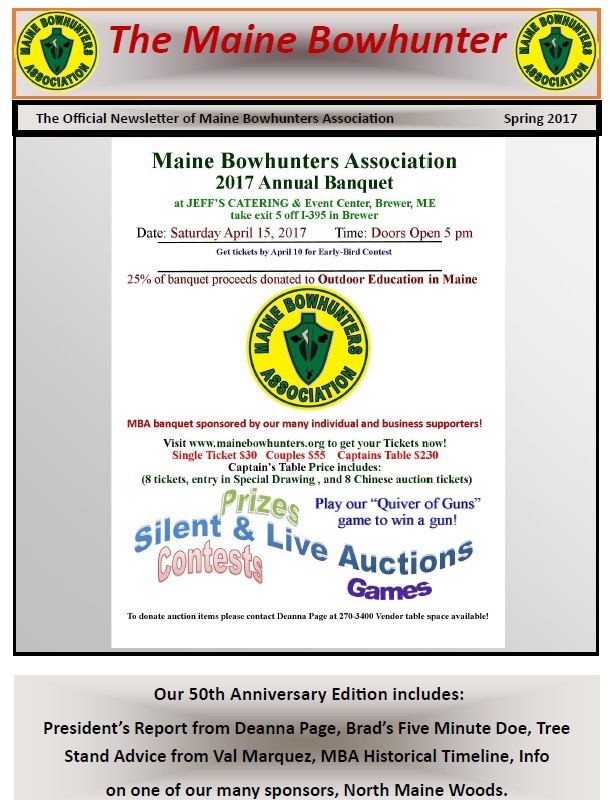 We at Maine Bowhunters Association are not opposed to crossbows for disabled hunters or for use during firearms season. We are opposed to crossbows during �archery only� season on deer. We have a very limited resource. When more harvest opportunities are provided for crossbows it will decrease harvest opportunities for other hunters. Less any-deer permits will be available to firearm hunters, and any future opportunities for youth hunters will have to be seriously scrutinized and likely denied. We believe any new opportunities for harvesting deer should go to youth hunters, not crossbow hunters. Many areas in expanded archery zones are already overcrowded with bowhunters because many landowners in those areas don�t allow hunting, closing off large tracts of land from hunting. Lack of access is the real issue here. We believe efforts to increase access through landowner and community education would be far more productive than putting more hunters with more weapons on already crowded properties. We believe this would actually be counter-productive by alienating more landowners to hunting. We cannot be compared to other states that have allowed crossbow hunting. Their management goals are primarily aimed at reducing deer numbers. Ours are aimed at increasing them. Most states have multiple doe tags, while we restrict the harvesting of does. We harvest about 25,000 deer/year. Most of these other states harvest 150,000 � 200,000 and even more. Most other states have very short firearms seasons that are outside the major phases of the rut. We have a very long firearms season that runs through all phases of the rut. Some states have a 4 month archery season, a few days of muzzleloader, and a week of firearms in late November or early December. Those states have great hunting and having crossbow during archery season is not a problem. Other states also have bountiful public land to disperse hunting pressure. We believe putting more pressure on an already diminished resource would fly in the face of wise conservation. Most northern states with low deer numbers have an �archery only� season without crossbows, because they know the added pressure on a limited resource can have a larger impact than in states with higher deer numbers. Maine has had one deer biologist in recent history who was successful at increasing deer numbers (Gerald Lavigne). He did so, not by increasing opportunities, but by decreasing them with the �any deer permit� system. This was a courageous position to take, and he faced a storm of opposition����.however, he was right, it worked. No attempts to increase opportunities have caused our deer numbers to increase. We hunters must be conservationists, not opportunists. We must conserve, not exploit. Archery only season was established in 1951 to provide those hunters who are willing to put in the time and effort to learn how to shoot and hunt with bow, a relatively solitary time in the woods. Never, in those 66 years has the legislature decided to eliminate that tradition of respect for bowhunting. It would be a shame to see that tradition lost. We think it unwise to be seeking more ways to kill more deer, by putting more hunters in the woods for longer periods of time with more types of weapons, in a state that is trying to grow its deer herd. We encourage all bowhunters to reach out to their Senator, to make sure their voice is heard. The following link will display the Spring 2017 issue of the MBA newsletter click here. IF YOU HAVE ANY PROBLEMS VIEWING THESE PAGES OR HAVE QUESTIONS OR COMMENTS ABOUT THE MBA PLEASE CONTACT THE WebMaster .